Find hidden objects at your own pace. Find objects by their picture, shadow, word or random combination. Sit back, relax, and play casual rounds with no time pressure or – if you fancy a challenge – you can play the trickier timed modes. 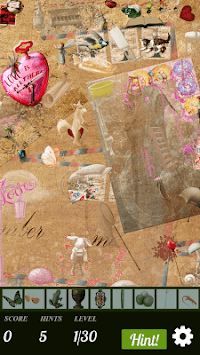 Can you find all the hidden objects before time runs out? Try our Campaign mode for the ultimate hidden object adventure! 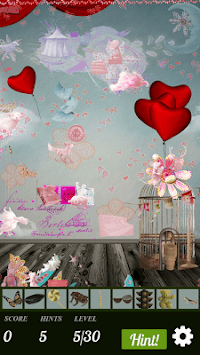 Explore 200 stunning Valentine’s locations in “Love Birds” and complete hidden object puzzles with increasing difficulty. Hunt down objects in a variety of ways, play challenging timed levels, and enjoy fun bonus rounds, and play mini games! Hidden objects can be hard to find when they are small or well hidden. That’s why we’ve made it possible to zoom and pan the HD images on each level. Stuck on a puzzle and can’t find the object? Hints are available when you need them! ★ Celebrate Valentine’s Day with our free app! No internet connection is required to play, so you can enjoy our fun hidden object game any place, any time! 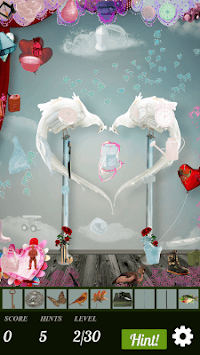 EXPLORE LOVE BIRDS IN A HIDDEN OBJECTS ADVENTURE TODAY!